2-1/8" center of inlet to end of stem 2-1/8"
Used on Vulcan, Wolf and Hobart models where part is applicable. Center inlet to end of stem 2"
Center of stem to the bottom of the inlet is 7/8"
Commonly used on manual valves. No longer comes with nut & ferrule. Inlet center to end of stem is 2-1/16"
Stem center to bottom of inlet is 7/8"
Rotation OFF/ON, stem position down. Center inlet to the end of the stem is 2-1/8"
Use for Imperial Ranges (Series) ICRA, ISP-J, models such as ICRA-1, ICRA-2, ICRA-3, ICRA-4, ICRA-5, IHR, IHR-6-C, IHR-G24-2-C, ISP-J-SP, ISP-J-SP2, ISP-J-W13, ISP-J-W16 and where part is applicable. VALVE, GAS - ON/OFF, 3/4"
the center inlet to end of stem is 2-18"
Center of the stem to the bottom of the inlet is 7/8"
Commonly used on Cecilware models such as AG 120, AG 120B, BC 1812, BC 1824, BC 1836, BG 12, BG 24, BG 36, BG 48, CCB 1812, CCB 1824, CCB 1836 and where part is applicable. Comes w/Nat Hood Orifice; If LP is needed use old replacement orifice. Sometimes referred to as a "Large Shaft Valve." 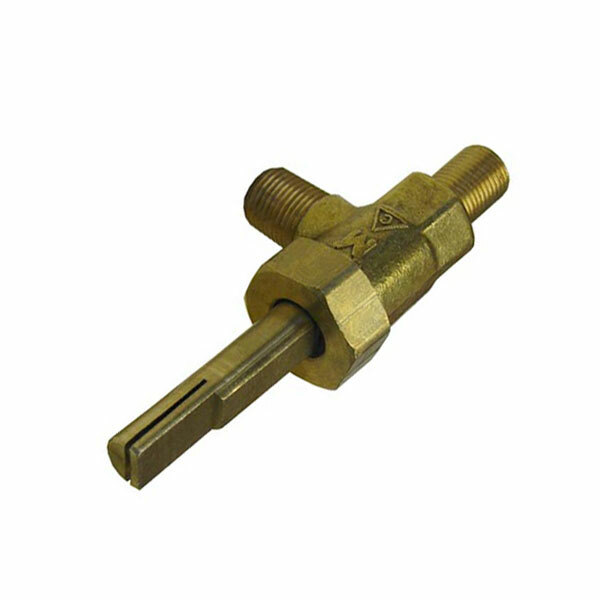 3/4" x 2" x D-Stem Size 1/4"
Commonly used on Garland models such as: GV280, G280 SERIES US BUILT UNITS and where part is applicable. Comes with plastic bag with needle and orifice. For most LP applications tighten hood down against needle and then back off 1-1/4 turns. I either case, adjust hood until burner maintains a constant blue flame.